Find all of the Cub Scout rank and adventure requirements here! Discover fun activities that can be used to complete those requirements. How to Make Easy Cub Scout First Aid Kits + Giveaway! Are your Webelos working on the First Responder adventure? Learn how to make a mini Cub Scout first aid kit with ideas for 3 different containers. Hiking games can make any hike more fun for Cub Scouts or for any kids! Check out these eight ideas that are sure to be hits on your next hike. 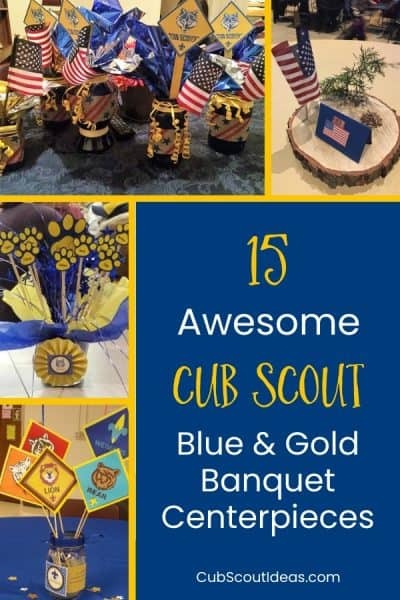 Check out these 15 Cub Scout Blue and Gold centerpieces for your next banquet. From simple to elaborate, you’ll find the perfect one for your pack’s event! Looking for ideas for awesome DIY Pinewood Derby awards? Check out these that are made from old car parts! Learn how one Cubmaster created these. This fun Cub Scout Outdoor Code printable puzzle is a great way to introduce the Code to younger Scouts and helps the older Scouts memorize it. Step by step, how to make the cutest campfire cupcakes, using pretzels and hard candy. Fun idea for a camping birthday or the Blue and Gold Banquet! Learning the Cub Scout Bobcat requirements is the first step that new Cub Scouts must take to earn their rank badge. Get a free printable to help them!